DIRECTION IS DEFINED as the line or course on which something is moving, or at which it is aimed to move, or toward which something is pointing or facing. Direction is commonly referenced as an angle made by a given line with an axis of reference, that is up, down, right, left, and so on. With geographic direction, the reference system employed is usually the latitude-longitude coordinate system with meridians converging on the North and South Poles and lines of latitude running parallel to the equator. The compass rose is the most common graphical representation of the directional angles referenced to the LATITUDE-longitude coordinate system. The compass rose has appeared on maps since the 1300s and it was originally intended to represent the directions of the winds. The compass rose gradually became the standard representation for expressing the orientation of maps and the directions on those maps. The compass rose comprises several sets of directional cues, and each of these has an associated angle, starting with north and increasing in a clockwise direction. First among these cues are the four cardinal directions—north, south, east, and west—with north having an angularmeasure of 0 degrees, east represented as 90 degrees, south as 180 degrees, and finally west as 270 degrees. The second set of directional cues is known as the primary intercardinal points, which are (in clockwise order) northeast, southeast, southwest, and northwest. The associated angles for these points are 45, 135, 225, and 315 degrees, respectively. Primary cardinal points are always named with north or south first, then with east or west depending on which two points are bisected. Lastly, the set of secondary intercardinal points (north-northeast, east-northeast, east-southeast, southsoutheast, south-southwest, west-southwest, westnorthwest, and north-northwest) bisects the cardinal directions and the primary intercardinal points. Secondary intercardinal points are always named by the nearest cardinal point first, then with the nearest primary intercardinal point. When angles are used to specify direction, this is termed the azimuth system of direction, and when cardinal and intercardinal points are used, this is termed the bearing system of direction. With the acceptance of the compass rose and its associated angles as a standardized means of specifying direction, interest turned to determining direction from a point (or between points) on the earth’s surface. 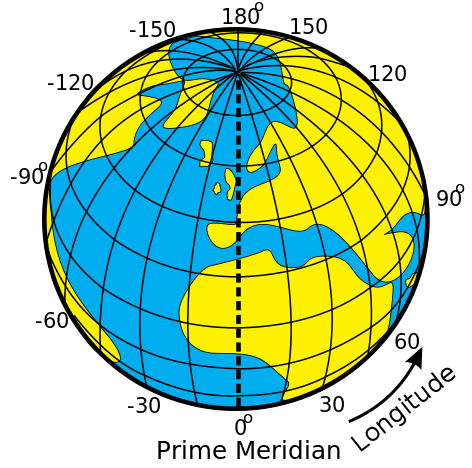 There are numerous ways to determine direction including using shadow measurements of the sun to determine the north-south line, recording the position of the setting sun on the vernal and autumnal equinoxes (due west), locating the star Polaris (North Star), which is within 1 degree of the North Pole, or similarly using the Southern Cross in the Southern Hemisphere, and using a nautical almanac that records celestial positions for every hour of the year, among other methods. When in the field, a magnetic compass is most often used for determining direction relative to magnetic north. Magnetic north and geographic (or true) north differ slightly, and therefore navigation based on a magnetic compass must correct for this variation. This can be done with the aid of a map that includes a declination diagram illustrating the local difference between magnetic and true north. One of the distortions caused by projecting a curved surface (the Earth) onto a flat surface (a printed map), is a distortion of directions. If the purpose of the map is to aid in the determination of direction, a map PROJECTION that preserves this property must be chosen. The problem of finding accurate directions is clearly of great importance in navigation, but direction can play an important role in social processes as well. As one example, consider that many religions have historically placed importance on the direction of prayer. If a worshipper wishes to face toward a particular place (such as Mecca in Islamic religious tradition) this direction should be determined by using a map that preserves direction between Mecca and the location of the worshipper.